When you’re pregnant, spotting and bleeding can understandably be terrifying. The only times you’re really educated about bleeding during pregnancy is on television, and it’s usually presented as a really bad sign. The truth is, bleeding or spotting during pregnancy is surprisingly common. While most of the time it isn’t actually anything to be concerned about, there is a possibility it could be a sign that something’s wrong. Here, you’ll discover everything you need to know about bleeding or spotting when you’re expecting. However, it’s worth pointing out the information below should be used as a general guide and any bleeding should be checked out by a doctor just to be on the safe side. Many women don’t realize that bleeding or spotting throughout the first trimester is pretty common. However, if it occurs during the first 12 weeks, it could be a sign that something is seriously wrong. Miscarriage is obviously the most worrying issue. However, it’s worth remembering that if baby’s heartbeat has been detected on an ultrasound prior to the bleeding, it’s highly unlikely you’ll miscarry. It’s estimated approximately 90% of women who do experience first trimester bleeding after a heartbeat has been detected, will go on to have a healthy pregnancy. If it is associated with a miscarriage, you’ll also experience strong lower abdominal cramps. The other issue linked to first trimester bleeding is implantation. This is the most common cause and it presents more as spotting, rather than bleeding. It occurs as the egg implants itself into the uterus lining. It should only last up to a maximum of a few days and the bleeding with be extremely light. Finally, first trimester bleeding can also point towards an ectopic pregnancy. This occurs if the egg decides to implant itself somewhere other than the uterus. Most ectopic pregnancies are developed within the Fallopian tube. It’s worth keeping in mind that ectopic pregnancies are even less common than miscarriages and occur in approximately 1 out of 60 pregnancies. So, while bleeding during the first trimester is worrying, it may not be as serious as you think. It’s really important to seek advice from your doctor if you do notice any bleeding just to be sure the pregnancy is progressing as it should. 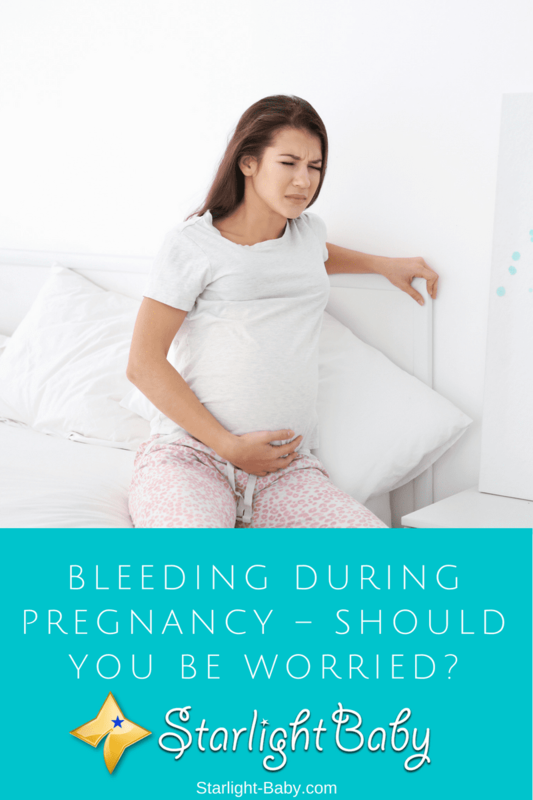 While most women worry about early pregnancy bleeding, it’s actually bleeding during later pregnancy which can be more concerning. This is because bleeding during the second and third trimesters is associated with more serious issues. For this reason, it’s very important you seek medical advice if you notice any bleeding or spotting during the second or third trimester. Most commonly, later stage bleeding can be linked to issues with the placenta. It could be you are experiencing Placenta Previa; a condition which is caused by the placenta sitting too low within the uterus, causing it to completely or partially cover the birth canal opening. If the Placenta Previa is bleeding, it should be treated as an emergency and treatment should be sought immediately. However, it’s worth pointing out that this condition is extremely rare and affects approximately 1 in every 200 pregnancies. Another cause of late stage bleeding could be placenta abruption. This occurs when the placenta completely detaches itself from the uterus wall either prior to, or during labor. It’s actually pretty serious and can be dangerous for both baby and you. However, like Placenta Previa, this condition is very rare and is said to only occur in approximately 1% of pregnancies. If you’ve previously had a C-Section, bleeding during the second or third trimester could also be linked to a Uterine rupture. Again, this is very rare, but the scar from the C-section could open up. Emergency surgery would be required as it is a potentially life-threatening issue. As well as bleeding, you’ll also likely experience tenderness and pain within the abdomen. The last potentially serious cause of late pregnancy bleeding, could be Preterm labor. In healthy pregnancies, you will typically experience preterm bleeding a few weeks before you’re due to give birth. It’s caused when the mucus plug passes and while it’s a normal symptom if it occurs a few weeks prior to labor, if it occurs earlier it could mean you’re due to give birth prematurely. So, if you notice mucus and bleeding and you’re not due to give birth anytime soon, you should seek medical attention. So, while bleeding during any stage of pregnancy can be potentially serious, the majority of the time it is completely natural. However, it is best to be safe and seek advice from a doctor if you do experience any bleeding, no matter how minor. It’s also a good idea to wear a sanitary towel prior to visiting the doctor so they can see how much bleeding there is. There is a possibility you may need to stay in hospital for observation, but this will depend upon the severity of the bleeding and what stage of the pregnancy you’re at. An ultrasound will likely be used to discover the cause of the bleeding and to check on baby’s health. Overall, bleeding during pregnancy is worrying, but the best thing you can do is visit the doctor and remember that in most cases, it isn’t anything to be concerned about. I still remember what my mother told us, She said that when she is pregnant for my lil’ sister it is I think her labor. And when she told my father that she is bleeding, my father become so rattled, nervous and don’t know what to do. When they are already at the hospital my father is still pale and my mother laugh at him. I cant imagine my very strong dad become so rattled when he sees my mother bleed. I think I will be my like my dad when my future wife bleeds too. haha. I could just imagine how confused/rattled your dad was during that time, haha. The situation of a woman who is about to give birth often makes other people panic, and eventually, confused. I guess that’s just normal when we are face to face with an emergency situation. This is where pregnancy plans play an important role because even if there is confusion initially, once the people calm down, they will follow and proceed with the plan. I think it’s normal to be worried about bleeding during pregnancy. But I think it will be lessened if you do some research like reading some articles like this one. More importantly, if you visit your doctor regularly. I think health education is a big help so that you can have a worry-free pregnancy. Yes, you are right. Both of my parents know that bleeding during pregnancy is just normal because my mom is a midwife before, she already explained it to my dad that it is just normal but still my dad gets rattled when she saw my mom bleeding haha and my mother just laugh at him while there are on the way to the hospital instead of being nervous too. When we are sharing thoughts here at home my mother always teases my dad because of that. Bleeding during pregnancy is truly alarming because most people associate it with miscarriage, especially for first time moms/dads. This article aims to shed light on this issue so couples will know what to do. And yes, you’re so right about health education or pregnancy education. It could really make pregnancy less frightening. I am so glad to have had the chance to learn about this early. I can imagine how scary it is to bleed during pregnancy. I only thought it happens when miscarriage occurs but I am happy to know it could be nothing serious. Abruption of the placenta, rupturing of a previous cesarean scar and having a miscarriage are three cases that are very dangerous and it is better to visit the doctor to rule out any possibilities. I’m really scared about ectopic pregnancy issue. I remember when I’m with my best friend in the coffeeshop, she collapses and I immediately rush her to the hospital. I was really shocked that the doctor said she was 2 weeks pregnant and unfortunately she lost the baby because of ectopic pregnancy. I feel bad for my best friend because I think she can no longer bare a child. After that incident, she never gets pregnant again. That is so sad 🙁 Did your friend consult an OB to get an opinion? Maybe there’s still hope that she could still get pregnant. If she could not get pregnant the natural way, there are other ways like IVF perhaps. The memory is still clear when mom had series of miscarriages and later lost the pregnancy of what could have been my fourth sibling at home. It was a visit to the hospital that the doctor told her to relax and not have issues anymore. It’s nice to read that sometimes, bleeding during pregnancy can be normal after all. Yes, it is sometimes a normal part of pregnancy, nothing serious. However, it is always best to consult an OB if this happens to be sure it’s truly nothing serious. Better safe than sorry. Better sorry than late is the actual word. I’ve been scared whenever I hear about anyone having bleeding during pregnancy period, but it’s good to read this and have my nerves calmed. Anyway what’s OB? Not late to learn. Thanks once again for your article, I am always trilled by your works, you do quite a lot of research that it only takes a patient person to, and I have an insight on this kind of thing. When I got pregnant, just one of those pregnancies that couldn’t stay, I bleed a lot and my family and some folks told me that it was okay to experience it as some pregnant women often bleed. I never knew I was going through some complications and that it had affected me deeply, I made a mistake by not going to the doctor until it hit me hard this is a mistake I still regret today because it led to the others, when a women gets to see blood while pregnant please rush to hospital and get examined don’t let negligence ruin your on born baby. I am so sorry to hear about your baby, Adesuwa08. Experiences like that always leave a void in a mother’s heart – the longing, the ‘what ifs’. I pray that God gives you strength in overcoming the trauma. And do not blame yourself because no parent would want such a thing to happen. The way I understand pregnancy is once it’s on, there should be any form of bleeding until child birth. The only time a woman is allowed to bleed is during her menstruation, so should bleeding or spotting shows up when one is pregnant, it should be taken with serious concerns and going to see the doctor is the best thing to do. Sometimes, bleeding is common during pregnancy. However, for women who are diagnosed to be at a high risk, bleeding should not be taken for granted. They should seek immediate medical attention. As you said, bleeding is a serious concern so no pregnant woman should take it lightly. It is best to consult with a doctor than assume it’s just a normal thing. My wife’s first pregnancy had to be terminated because there was no embryo inside the fetus. The second pregnancy went through a miscarriage. When my wife was pregnant for the third time, we were very careful. Thankfully there was no case of bleeding. Currently my brother’s wife is pregnant. She is in the first trimester and blood was spotted,. Thankfully everything is alight.